New Gadgets Are Fun But Why Not Love the One You're With? As a tech reporter a lot of gadgets pass through my hands, but I’m a lousy early adopter in my personal life. I think the reason is readily understandable: it’s money. I don’t like to spend a lot on gadgets when I can make smart decisions and then just enjoy what I’ve bought. And by using this approach I get an added bonus. When I do buy a new gadget it’s because my old device was really on its last legs. So I get the excitement of having the latest, newest thing, plus a legitimate quality of life improvement. On Thursday I got an iPhone 5S. Four days later I’m still blown away by it, but not because it’s good. I mean it is good. It’s a solid smartphone with the usual number of drawbacks. But I’m enjoying it so much because my old phone was a pitiful mess by the end. I got the CDMA iPhone 4 in February 2011 when it debuted on Verizon. The iPhone 4 was a great (if antennagate-burdened) smartphone and my unit was no lemon. It handled my heavy use, beta OSs, and app testing gracefully. I didn’t start having problems with it until its second birthday. At which point I had pretty awful problems with it. Apps crashed all the time and random restarts were typical. The camera took 20-30 seconds to turn on. The phone would freeze during syncing. Battery life dropped off a cliff from fairly solid to abysmal. And then two weeks ago I dropped it. Womp. I almost didn’t want to pick it up because I knew I had shattered the screen. Normally I would have been really upset. A big part of the whole not-buying-a-lot-of-gadgets approach is not breaking your gadgets. It’s no coincidence that the people who leave their phones in cabs or jump fully clothed into an unusual number of pools are the people who have new phones the most often. And there’s nothing wrong with that. If you have the money or it’s your only vice it’s no big deal. But I’m usually hard on myself when I break something, especially something that was expensive. Except my iPhone 4 was different. It sucked so much at that point and I’d kept it safe for so long that I just couldn’t bring myself to care. Sure I had lost out on resale value as of that moment, but it just felt like a fitting end for that device. 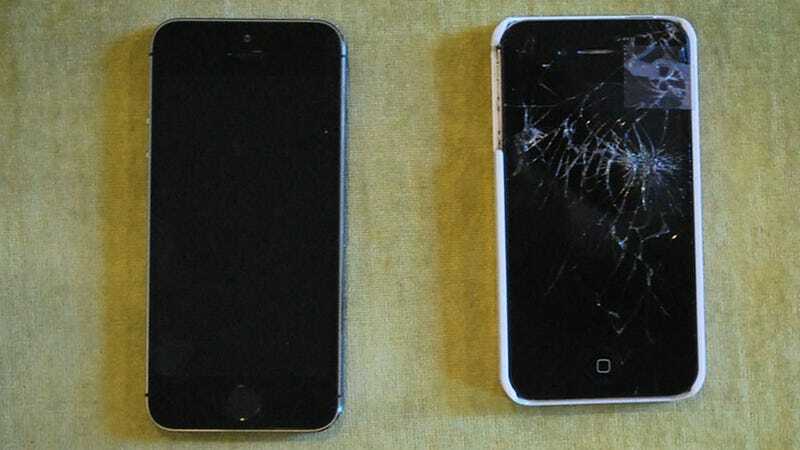 I lived in constant fear of gorilla glass shards for eleven days and then my 5S arrived and life got better. If you use your smartphone heavily you know that load screens and restarts can add up every day. It’s the same thing we all went through with dial-up and DSL. You’re just frustrated. Getting that time back feels amazing and I really appreciate the processor difference because of the clogged, sluggish situation I was living with. Except maybe I'm just appreciating having a working phone. It’s a valid point that any upgrade would feel like a huge improvement to someone like me. Even a new 4S would seem snappy and would allow me to say hi to Siri. But I have a few thoughts about that. First of all, I was familiar with the current smartphone context before I got a new phone myself. I’ve had words with Siri. I know how responsive the Galaxy S4 is and I’ve taken photos on the Nokia 1020. I get it. But also that’s the whole point. When I first get a new gadget it feels great and exciting simply because I needed it so badly. But when the honeymoon phase is eventually over (and it can be pretty long depending on how scarred I am by the final few months with my previous device) I’m not bored with what I have. In fact, that’s when I start appreciating it for what it is. The choices and investments I made in the device really start showing their worth after the first year, so just as something new and better is rumored or coming out, I’m first appreciating and admiring what I have. It really is. I don’t own a tablet or a smartwatch. I’m not into fitness tracking. I use my seven-year-old iPod Video almost every day. And my point and shoot camera is from 2008. My smart TV and router are both pretty new (I got them when I moved a year ago) and I’m still taken with both of them. I’m lucky to have a job where I can get my technology fix without having to spend my own money and I’m glad I’ve found a way to avoid the pressure of product cycles even as I obsess about them every day. When I do buy something new it feels amazing. Life is noticeably different. And on all the days when nothing is new, my arsenal feels stable not stagnant.